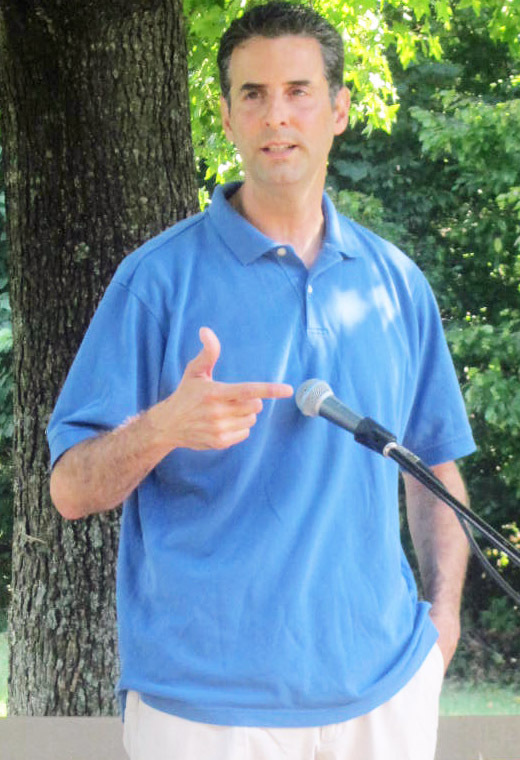 Rep.John Sarbanes at Labor Day picnic in Columbia. Labor Day used to be considered the traditional start of the fall election campaign season, but even with the 2014 election a year off and the primary 10 months away, Labor Day weekend was still not too early for candidates to be politicking. Dan Bongino, last year’s Republican U.S. Senate nominee, held a major fundraiser in Frederick County Friday night in what he concedes is “going to be a tough election” to unseat freshman Democratic Congressman John Delaney in the 6th District. But he made no mention of a book he wrote due out in November, which details why he chose to leave the Secret Service and run for office. The setting was the clubhouse Whiskey Creek Country Club in rural Ijamsville, but Bongino had a different sport on his mind. “We had to go one more round,” Bongino said. He portrays himself as an outsider to the Republican Party establishment in Maryland, as when he introduced Republican National Committeewoman Nicolee Ambrose. She won a contested race for her position against former state GOP chair Audrey Scott. “Nicolee is great,” and he knows it “because the establishment can’t stand her,” Bongino said. After the 2012 election, Bongino said he resented how the Maryland party sent volunteers to help the Mitt Romney campaign in Pennsylvania and Virginia, while offering little help to his race that was being undercut by the independent Rob Sobhani who spent millions of his own money. But despite the anti-establishment tone, several Republican delegates attended the Bongino event, including House Minority Leader Nic Kipke and Del. Steve Schuh, whom Bongino said he would endorse for Anne Arundel County executive. Several newbie delegate candidates who had been inspired by Bongino also gave the candidate a boost. “Everybody needs health care, but everybody doesn’t need government health care,” Bongino said. Bongino already has a primary opponent, David Vogt, an ex-Marine who, unlike Bongino and Delaney, actually lives in the 6th Congressional District and has filed for the seat. Vogt, pronounced VOTE, filed Aug. 19, and called on Bongino to take a united front against Delaney. “”I’m here all the time,” Bongino said. “I wouldn’t support any kind of action in Syria,” he said. In ways, Bongino has more of a national profile than locally. He’s been a regular guest on Fox News and other cable programs and on Aug. 22, he guest hosted the Sean Hannity nationally syndicated radio show. The promotional blurb on Amazon says: “Why would a successful, twelve-year Secret Service agent resign his position in the prime of his career to run for political office against all the odds? Why is it that the Washington DC ‘Bubble’, a haze of lobbyists, cronyists, staff, acolytes, consultants and bureaucrats surrounding the President, creates a ‘Bubble’ which distorts his view of the world and detaches him from the tragic results of his poor policy choices? But “we know you and people across the country are war weary,” both “weary and wary” of more foreign military intervention. On Saturday, Obama said he will seek permission from Congress to lead an attack on Syria. Sarbanes said Congress will be debating the issue “24/7” when it returns to Washington next Monday. He said he wanted to hear what constituents thought about the attack on Syria, but he did not say how he would vote. Sarbanes said the debate on Syria will kick off what already was shaping up to be a difficult fall session with a House of Representatives sharply divided on reducing federal spending, raising the debt ceiling and Obamacare. He blamed the impasses on a political system “almost completely captured by big money and special interests,” and he pushed his own proposal for the Grassroots Democracy Act, that includes tax credits for donations of $50 or less, and matching funds if candidates forego other sources of campaign money. This new monthly roundup covers Maryland election news in July for statewide, congressional and executive races. The 2014 primary has been moved from September to June, and many candidates are out early in response to the new calendar.